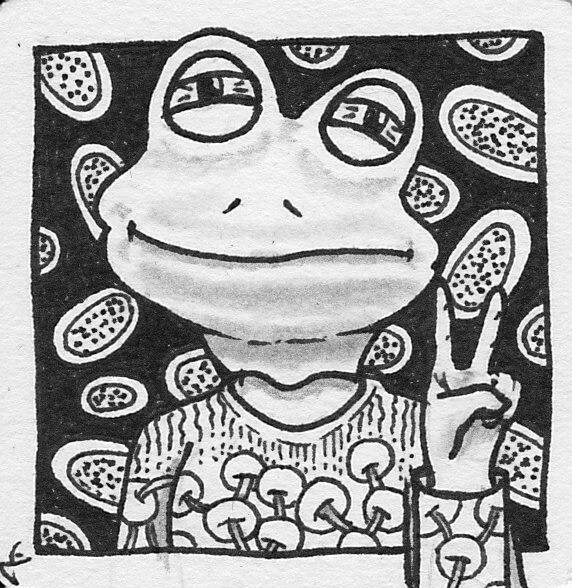 The end of the second week of Inktober is here. Wow, two weeks of drawing and tangling on a daily basis! 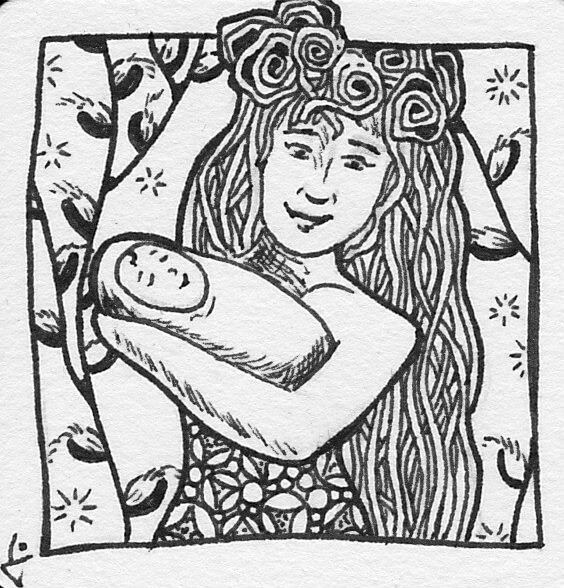 I’m really proud I made it to this point, but I’m quite sad that this project needs all the time I can spare at the moment and that other articles I want to write and other projects like tangling through “One Zentangle a Day” by Beckah Krahula will have to wait until November.. Maybe I can treat Inktober as a warm-up to what will come? 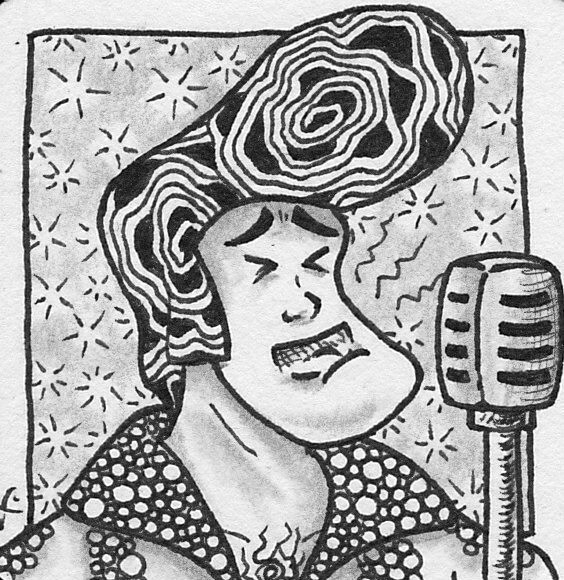 Today I have the third male character in a row, which is another thing I’d never thought would happen before I started Inktober. Men are not my specialty (as you can deduct from this guy’s anatomy…), but it is a welcome change! How do you like my Djinn? 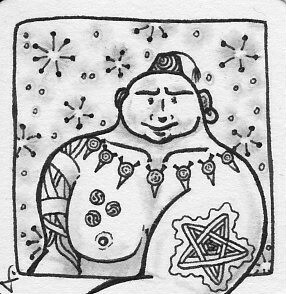 When I had inked the Djinn, I thought that some tattoos would look good on him – tangled tattoos, of course. Finding the “right” ones was a bit harder this time. Auraknot and Hypnotic were easy, the rest was hard. This chain of spiky circles was an invention of mine since I couldn’t find anything that fit here for my taste. I’m not sure if I will name it or play a bit longer with it. What is your opinion? 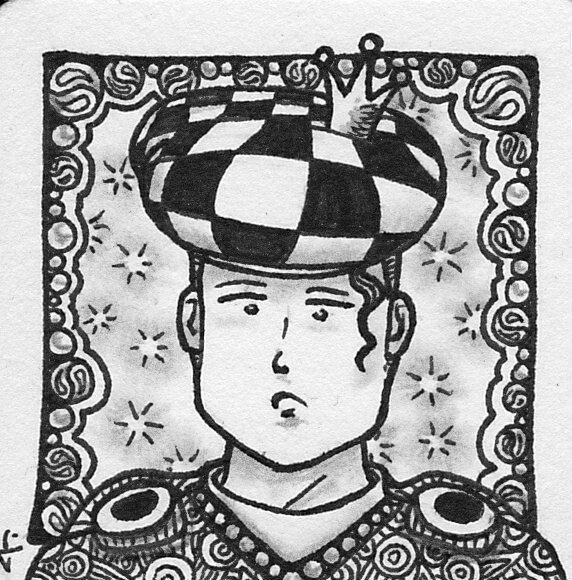 I also thought about “violating” my black&white colour scheme here and give him a golden earring. But I think that some things simply should stay as they are and black&white (and a little grey) are quite enough right now. 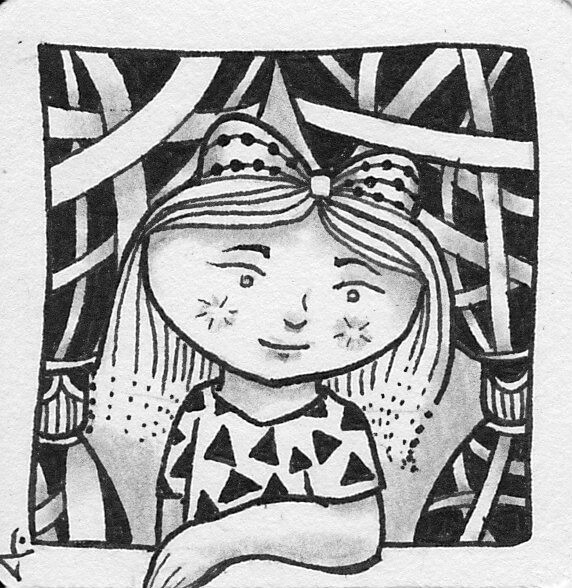 To me it’s incredible that I haven’t used one of my favourite tangles yet for Inktober: Paradox. It is not only simple and easy to draw, but comes with just SO many ways to modify and to use it – I love it. 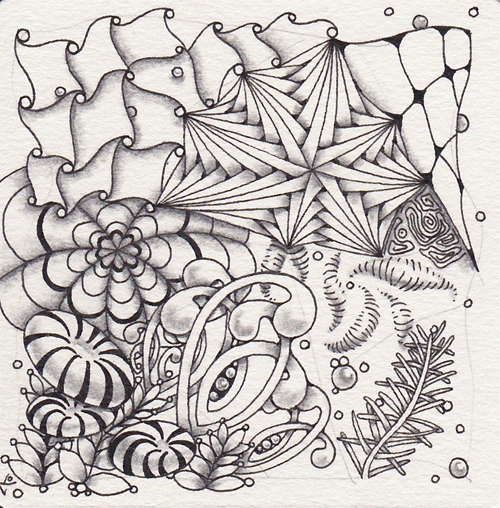 If you haven’t yet read Margaret Bremner’s brilliant article “And then some… Paradox”, then I think now is the time to do so (she wrote even more “And then some…”-articles which are ALL great and a must-read for every Zentangle enthusiast). Then I remebered something I wrote in this blog about tangle transitions and combinations and mixed some Cruffle into Tipple. Looks nice. Then I tried a tangle I’ve never used before: Points and Curves. It has a nice optical illusion and is easy to draw, I might use it again in the near future. Cadent I added because I then had circles, squares (or something similar) and triangles – I liked this idea a lot. Apart from my recent favourite CO2, I like Knightsbridge best here. Doesn’t it look as if his hat was coming out of the picture? It is a lovely effect that I really want to play with more. But I don’t really know any more tangles with this effect – do you? New day, new Inktober drawing! 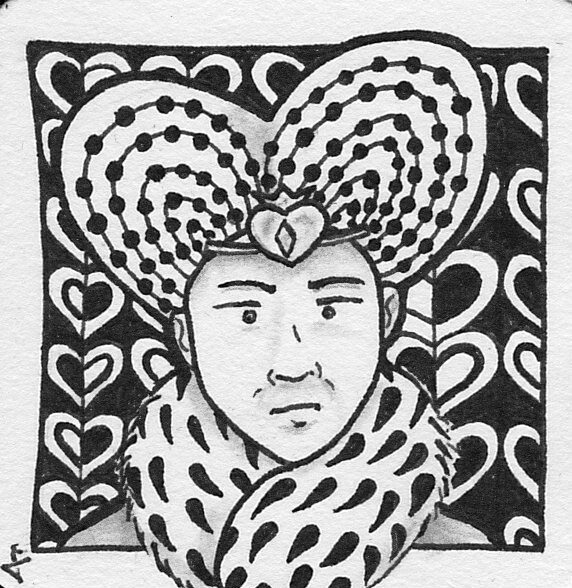 I still didn’t get to draw anything für the “Zentangle a Day”-project.. or this week’s Diva Challenge… But let’s be positive that I can get around to do it (or at least one of them) today. I somehow have the feeling that the drawings for Inktober are getting a little harder. Of course, I don’t want any repetitions since that would be boring, but my method for drawing the basics of these little bijou tiles seems to run into a dead end. I put a dot in each corner and then connect the dots to get my frame. 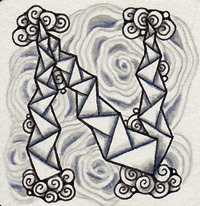 Then I start from the bottom line and draw a squiggly line up and down again (that’s something like Zentangle so far). Is it a female or male shape? In which direction does the person look? Is that the hair or do I have to add a shape for hair (or a hat 😉 )? And so on. 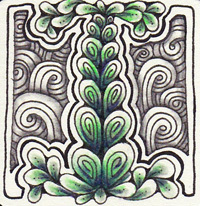 Sometimes it is very easy and I see something in my “string” (that’s what in Zentangle this squiggly line is called) immediately, but recently the strings look either quite similar to something I’ve drawn before, or I just can’t see anything in it – and erase it (the dirty word in Zentangle! ;-D) and start again until I see something. Then I modify the squiggly line to my needs and start inking and tangling – that’s it. Looks a little like divination with tea leaves, doesn’t it? Maybe my third eye has gotten tired? *g* I don’t know. I guess I’ll have to think of something to freshen this “technique” up a bit. I already used a geometric shape in the middle of the tile once and tried to draw my squiggly line from the top. But I wasn’t THAT excited about the result. Do you have an idea? Tomorrow I’m off to work again, too. I sincerely hope that Inktober won’t keep me awake for so long like last week.. I’m happy I hung in there, bu it definitely was exhausting. (Hope to) See you tomorrow for Inktober 11th! I wonder how many more uses of CO2 I can find! 😀 This time I used pencil shading again because I thought that the softer shading would be more appropriate for the young lady. I think it was a good decision. But thanks to the weekend I’m positive that I’m back to the normal rhythm of posting it on the same day. At least for two days. Start of the second week of Inktober! And a late upload again.. but better late than never! 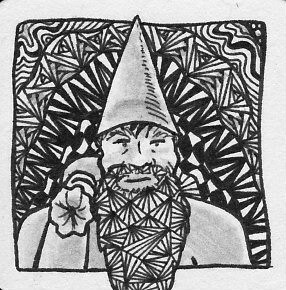 First week of Inktober was a lot of fun – not only tangling my own bijou-sized tiles, but also enjoying all those wonderful drawings everyone else has made for the challenge. 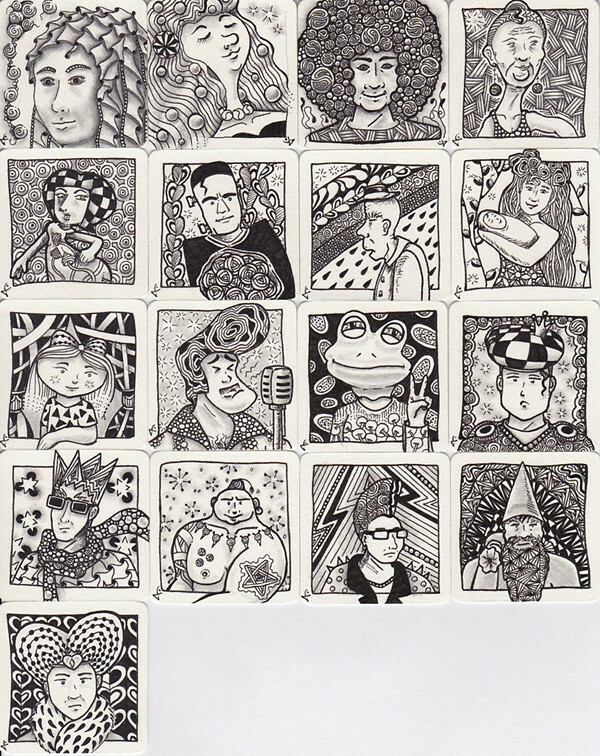 I retweetet a few for you to enjoy (Zentangle, Zentangle-inspired and more). You can look up my favourites from all those pictures I saw on Twitter under my Account @tangleoflines. It’s only a very small number compared to all the drawings that people link via Twitter, the sheer number of tweets with #inktober is absolutely amazing! Like this on a lot! Finally a chance to use one of my favourite tangles, Diva Dance. It find of looks like she has flowers in her hair, don’t you think? And Keenees just looks SO different since the circles seem to vanish into nothing and the bright parts seem to make up a whole different pattern. I really love this challenge, but I wish my busy private life would leave me a little more free time to continue my “One Zentangle a Day”-project, too.. I’m sorry that I have nothing else for you at this moment than Inktober, but promise I haven’t forgotten about the other project or all the other interesting stuff I have in mind for this blog! 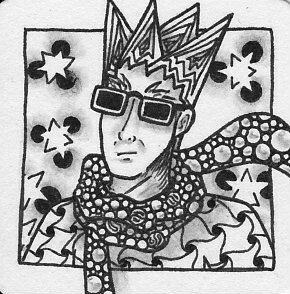 I already pretty much finished the tile for the third day last weekend, but “have” to draw a new one. Why? Well, you’ll see and understand when I show you… 😉 I hope that I have time to tangle the second tile this weekend. Actually, I wanted the rainbow to get lighter going “up”. I’m not sure I really got the result I wanted but it still looks nice to me. 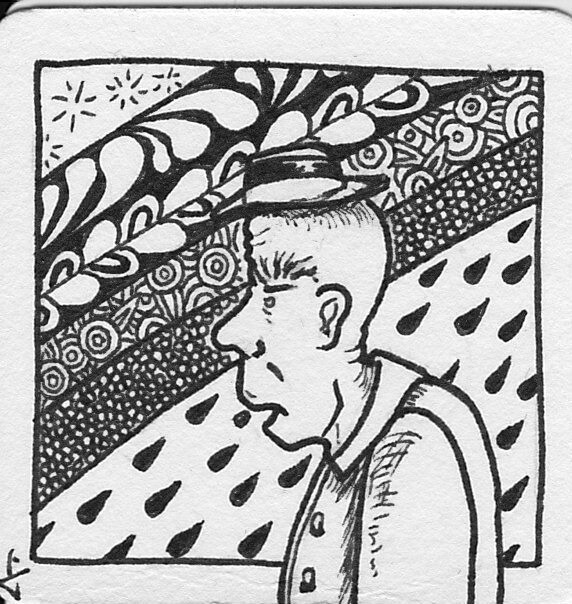 Just like yesterday, this is another tile without pencil shading. 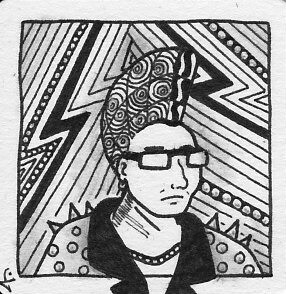 I only added a little (sloppy, I’m afraid) hatching and cross-hatching here and there. I like the effect and I guess it is more truthful to the original idea of Inktober. I hope your Inktober challenge has been a success and a lot of fun, too! And if not: Tomorrow is another day to jump in! Hope to see you here then, too.